"Love" token, awarded by zeffii. "Love" token, awarded by Blendify. A good visual style for widgets (buttons, menus, scroll bars... etc) is subjective. Some prefer really modern looks with edged and flat UI elements, others like rounded elements with shadows and highlights, others again prefer the old and classic look, ... this may come down to personal taste, but there are practical aspects to it as well. The ability to select different styles allows introducing new styles without causing frustration to existing users who prefer to keep the interface unchanged. The idea of the "Interface Style" option is to provide a way for the user to easily change the look and feel of the UI to fit his taste. Recreating other application's or OS' GUIs is out of scope, instead it should give variations that change the visual appearance on the whole. Julian Eisel (Severin) raised the priority of this task from to Needs Triage by Developer. Julian Eisel (Severin) added a project: User Interface. is not already the scope of "presets" dropdown menu on top left? 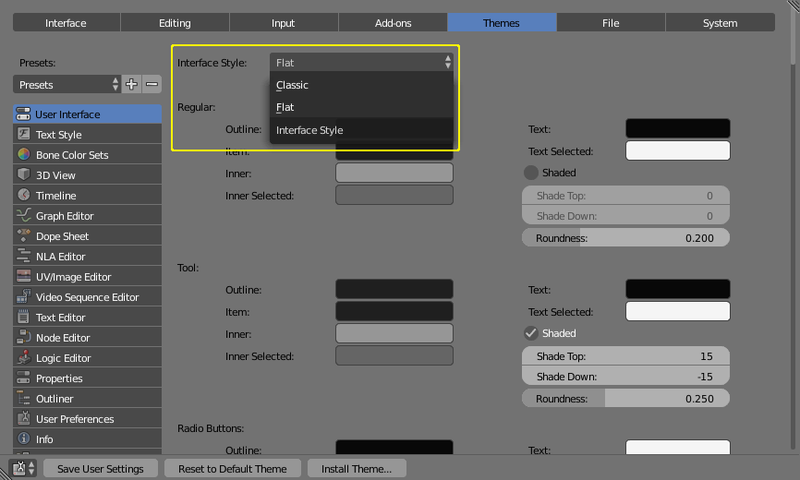 @blend-it (blend-it), while the presets also change the look of the UI, they only touch the theme, meaning they only change colors (also font sizes, shadow sizes etc). But colors are only one part of the GUI appearance. The Interface Style would allow to influence the widget drawing directly and easily, without having to add tons of user preference options (so we could even get rid of things like shaded or emboss options). This comment was removed by Sergey Sharybin (sergey). @Remigiusz Fajfer (aspagnito), thanks for the suggestions, but this is really off-topic. This task was made for a specific feature, not for broad suggestions. E.g. the blender navi proposal would fit better into T38035. THANX. I am new here. Sorry, I will post the message there. Dealga McArdle (zeffii) added a subscriber: Dealga McArdle (zeffii). I've done a demo to show the most minimal version of the sliders. The gradients or not of the lines below the values, show whether the attribute is finite or not. Some functions are displayed when you hover over the cursor. I think in my version the values stand out better.